Data for Q1-2018 real GDP will be released on Friday, April 27. The Atlanta Fed’s GDPNow model predicts 2.0% q/q (saar) based on data available through April 17. That would put the y/y rate at 2.8%. I prefer the y/y metric because it solves the annoying “residual” seasonality problem that has plagued the Q1 figure, which has tended to be weaker than the other quarters’ figures since 2010. On a y/y basis, real GDP growth has consistently meandered around 2.0% since 2010, with a low of 1.0% and a high of 3.2%. Also meandering around 2.0% has been the y/y growth rate of the Index of Coincident Economic Indicators (CEI). It’s not a coincidence that this growth rate closely tracks the comparable growth rate in real GDP. The CEI was up 2.2% y/y through March. During 2010, pessimistically inclined economists observed that 2.0% growth had been the economy’s stall speed during all expansions since WWII. In other words, 2.0% growth meant a recession was likely to occur soon. It’s eight years later now, and real GDP still is growing around its purported stall speed without stalling. (1) Leading indicators. The Index of Leading Economic Indicators (LEI) first rose above its previous cyclical high during March 2017 and hasn’t looked back since then. That’s relatively recent, and suggests that the LEI has time to climb higher in record-high territory, as it has in the past. Keep in mind that the yield curve spread is actually just one of the 10 components of the LEI! (2) Coincident indicators. Back in 2014, I predicted that the next recession wouldn’t happen sooner than 2019. I based that on my observation that the average length of economic expansions after they recovered above the previous cyclical high was 65 months over the previous five cycles. The CEI started making record highs again during February 2014. Using the average of the past five cycles as a benchmark would place the next business cycle peak during March 2019. (3) Boom-Bust Model. 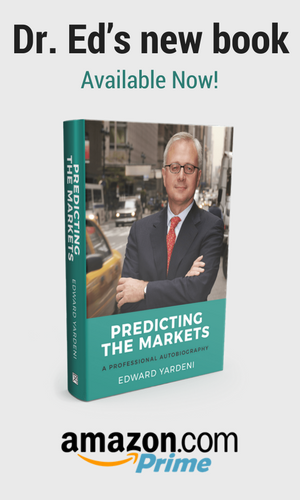 In Chapter 5 of my new book, Predicting the Markets: A Professional Autobiography, I discuss my Boom-Bust Model of the business cycle. The bottom line is obvious: Booms set the stage for busts, so if there is no boom, then there will be no bust. During booms, financial excesses mount. Too much debt finances too much business activity. The resulting inflationary and speculative excesses cause interest rates to rise to levels that burst the debt-fueled bubble. A financial crisis occurs, triggering a credit crunch, which causes a recession. Most recessions coincide with a financial crisis.